Preheat the oven to 190°C. Heat the oil in a non-stick frying pan, and cook the bacon for 4-5 minutes, until lightly browned. 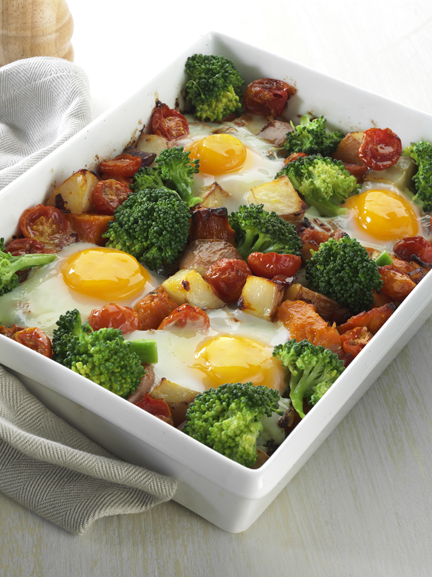 Combine the bacon, potatoes, pumpkin, onion, and tomatoes into a 30 x 20 x 6cm (8 cup capacity) ovenproof dish, and spray with oil. Bake for 1 hour, turning the mixture once or twice during cooking. Place the broccoli into a large heatproof bowl, and cover with boiling water. Stand for 2 minutes, then drain. Remove the dish from the oven, and mix in the broccoli. Push the mixture out to make 4 holes, spaced evenly apart. Carefully break an egg into each hole. Return to the oven and cook for 10 minutes, until the whites have just set. Use a large spoon to scoop out the eggs, and surround with the potato mixture. Serve immediately.